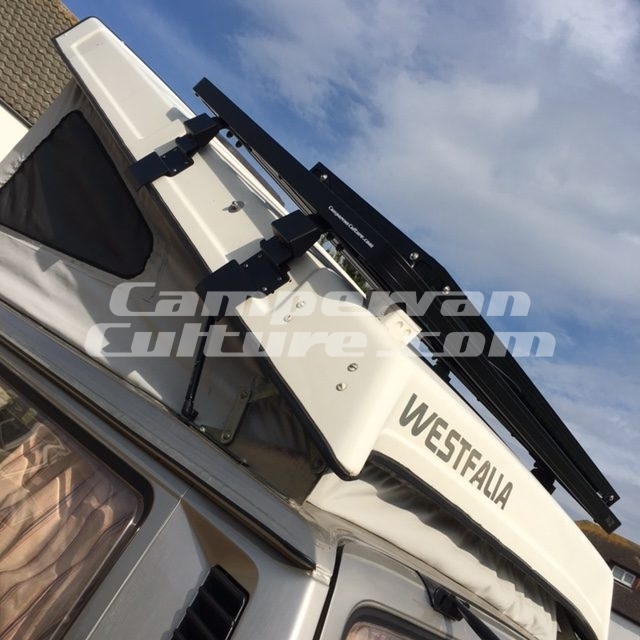 The CVC supplied T25, T3, Vanagon Westfalia Pop Top Roof expedition aluminium Front Runner roof rack is a solid light weight modular system that can be set up for you and your vehicles requirements. 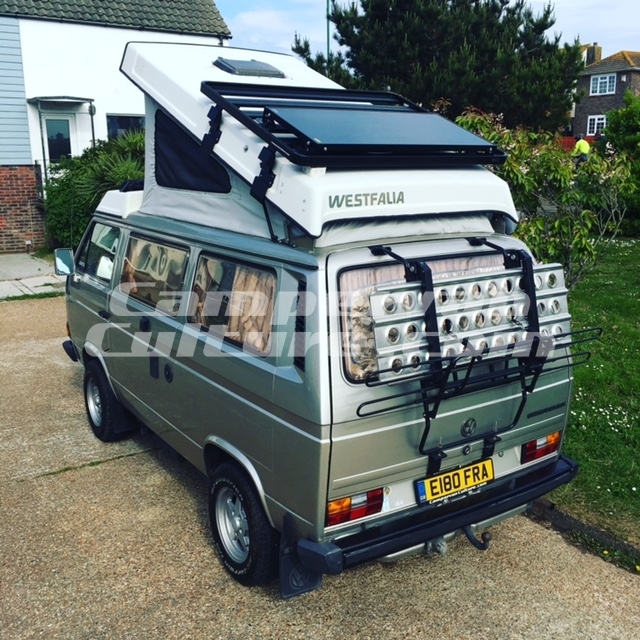 Once you have the base roof rack set up you then have a huge range of amazing add on accessories from water or fuel and wheel carriers to storage boxes, bike, surf board or kayak carriers, bass bottle carriers, aluminium table carriers, Hi-Lift jack, axe, shovel even shower carriers as well as brackets for fitting awnings and roof tents.. The sky really is the limit! SKU: CVC-WESTYSHORT. 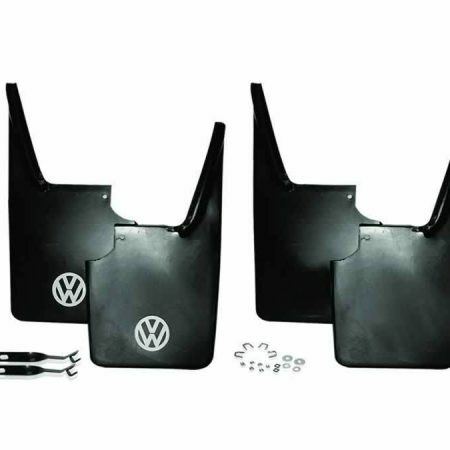 Categories: Latest Products, VW T25 Aluminium Expedition Roof Racks & Accessories, Westfalia Pop Top Aluminium Expedition Roof Rack & Accessories. Tag: mods+upgrades. 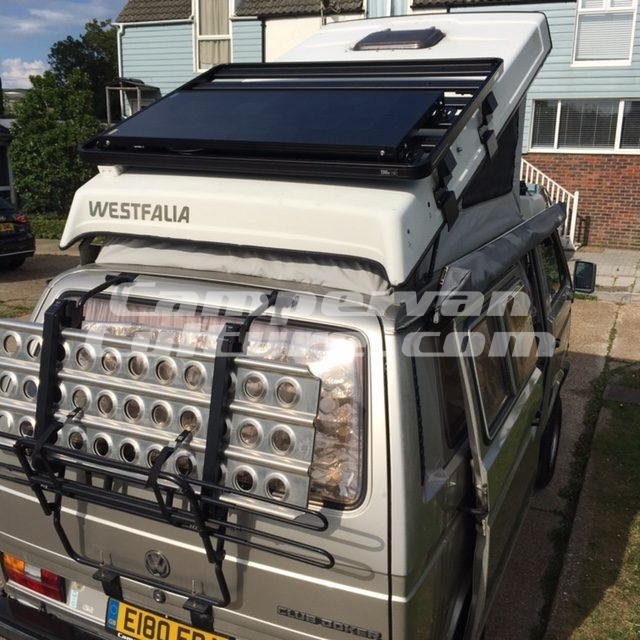 The CVC supplied T25, T3, Vanagon Westfalia pop top roof *Half Length* expedition aluminium Front Runner roof rack is a solid light weight modular system that can be set up for you and your vehicles requirements. If you have a skylight no problem, you can just miss slats out where that is. Once you have the base roof rack set up you then have a huge range of amazing add on accessories from water or fuel and wheel carriers to storage boxes, bike, surf board, snow board or kayak carriers, gas bottle carriers, aluminium table carriers, Hi-Lift jack, axe, shovel, fishing rods, even shower carriers.. The sky really is the limit and with owning a small vehicle like we all do storage and safe organisation outside of the vehicle is key to keeping a clutter free inside living space on trips away. 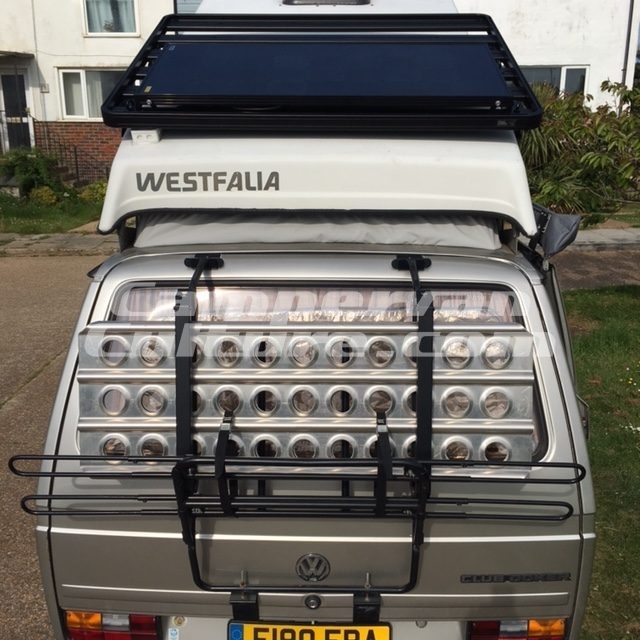 The Westfalia *Half Length* pop top rack comes with two gas struts and a set of supporting brackets that are super easy to instal in the kit that help lift the roof with the extra weight. Also included is a set of light weight aluminium gutter brackets that bolt to the side of the fibreglass roof with spreader plates. When the roof is down and the vehicle is moving and the rack is loaded up all of the weight up top sits in the factory gutters so not to put any stress on the pop top roof. 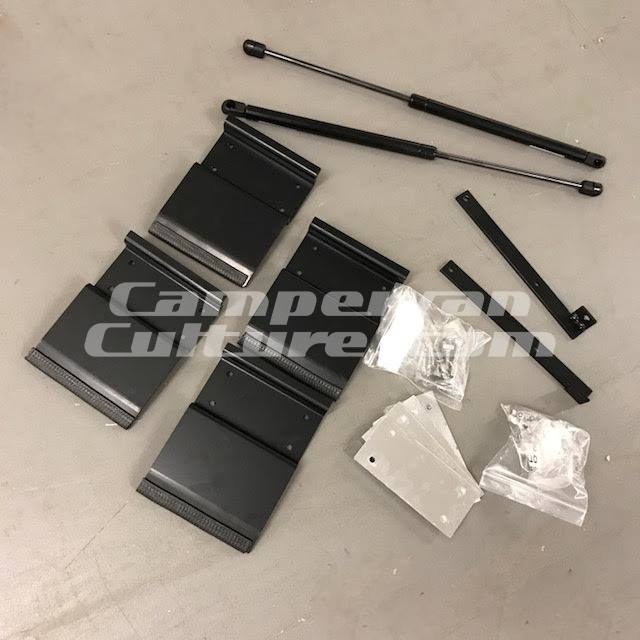 If you all ready have our side roof brackets and HD roof lift kit and you just want to buy the rack, please let us know so we can look up your past order and discount those parts from the whole cost of your new rack. 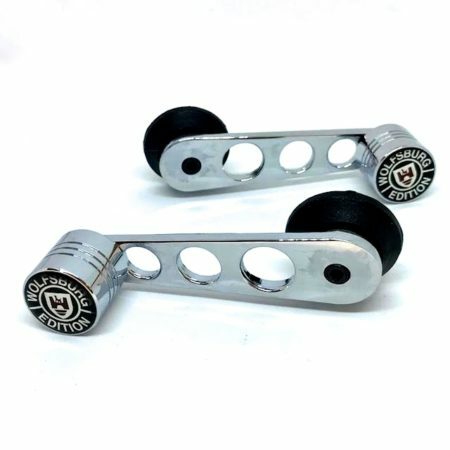 You will have to the new strength gas struts though and add the extra support washers that come in the new roof lift kit. 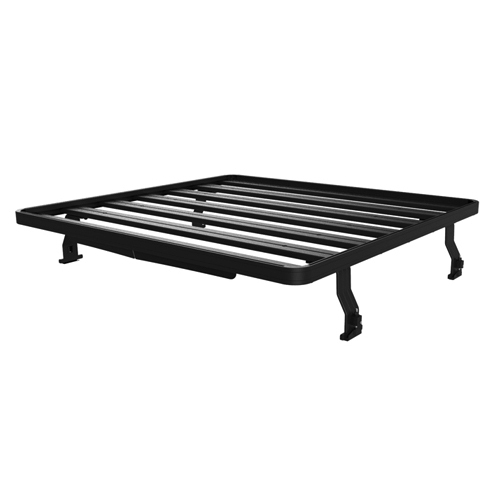 Please note – This is not an off the peg roof rack from some other vehicle and is not available anywhere else. 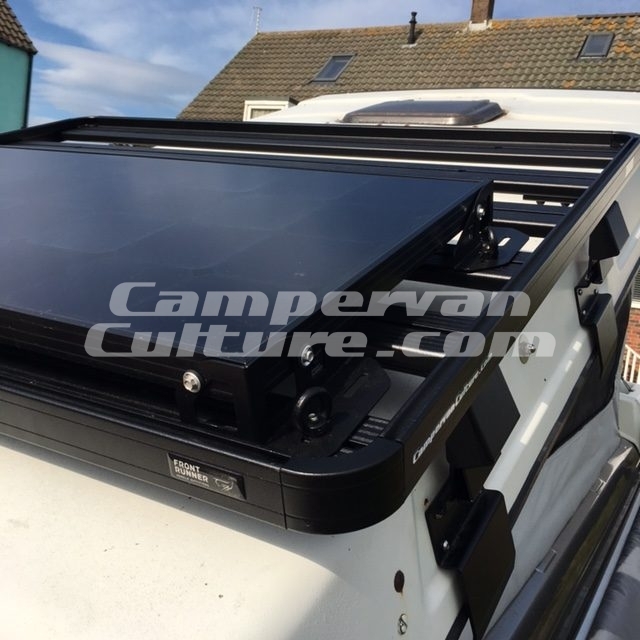 This rack and the extra components to make it fit perfectly has been tailored to fit our vans by CampervanCulture.com. One roof rack per order, all accessories such as solar panel kit etc are add on items but we don’t need to tell you that but had to mention it anyway! For orders outside of the UK/France/Germany/Belgium/NL/Spain/USA please contact us for an accurate shipping cost as the one automatically generated may not cover the cost of your delivery.